Life is too short to not eat out, and I eat out. A lot. With a book called RETOX, you better believe I am not eating steamed kale and quinoa when I’m out. I’m more of a steak, burger, pizza kind of gal. The thing, eating out does not have to be unhealthy. You just need to know what look for on the menu. Even the most indulgent restaurants have healthy EEEEEATS that can leave you feeling guilt and fomo free. Here are some of my favorite NYC restaurants, and my RETOX EEEEEATS at each. Keens: I was a vegetarian my 7 years on Wall Street and since founding I.AM.YOU. eat red meat 3x a week minimum. The thing is, steak houses are the best places to eat healthily. Start with the wedge salad – epic. Just no bacon. Get the steak you want how you want it – me usually a filet well done (I know, don’t hate me) – with sides of mashed potatoes (because you have to), broccoli because it is the best vegetable ever, and asparagus for its enzyme that helps breakdown alcohol. Not to give you too much of a spoiler alert, but my #RETOX Hangover Helper cure usually included the asparagus to prevent me from my hangover, the B12 from the steak, and the electrolytes from the iceberg lettuce and broccoli. The cheese cake I have, well, because you gotta. La Esquina: Every cali girl loves her Mexican food. Hit up the steak tacos for a simple and pure shot of Vitamin B12 (ie energy). They make it clean and simple with no funky sauces, topped upon corn tortillas, the way it should be. Get the house salad as a side or to start with the tortilla strips, sesames and avocado you will forget about the chips and guac… for a moment. And don’t forget their Tortilla Soup – the best in the city. Pure tomato broth with the perfect mix of crunchy bits. I get mine without the chicken or cheese so I can save room for another round of chips, or tacos. Very #RETOX. I Sodi: With a last name like Imparato you better believe I eat my pasta. I sodi is the closest thing to dining in Italy in the city. 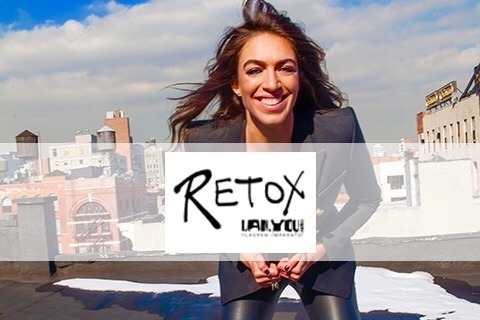 Let it rip here in full #RETOX la dolce vita style – it’s worth it. Hit up the Cacio e Pepe and the lasagna if you like pasta like me. They are light and perfect. I actually avoid the salads, as they all have cheese, which I would rather have on a pasta, so I get a side of their peas, which are unlike any others you have ever tasted. Topped with a glass of lambrusco, I’m good to go. Balthazaar: The French Brasserie of all brasseries. Before you finish your first glass of Bordeaux, or bubbles, order the Haricot Vert. Best in the city, and ensures you are getting your greens no matter where this institution takes you. I vacillate between the burger and the salmon here. If I get the burger, which is very clean and non greasy, I swap the fries for a salad, with my already order of haricot verts. As one of my #RETOX Low energy cures, I get the Salmon however it comes on days I have been tired, lethargic, stressed, or thinking unclearly for the omegas. Either way I leave energy charged ready to take on the city. Landmark Diner: You can’t write about city EEEEEATS without a diner, and Landmark is one of the last good ones left. My favorite thing here is simplest – their Egg White omelets with spinach. A classic #RETOX breakfast to keep you charged with energy throughout the day. Their house salad is also incredible – mainly because of the old school Italian American red wine vinaigrette they make for it. Add on a cup of original straight up black coffee, you are good to go.